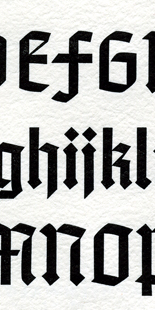 A "New" Blackletter Typeface Available! Our shop is devoted to the book arts, particularly the craft of fine letterpress printing and traditional book typography. The typefaces and ornaments displayed throughout this website are cast in our shop foundry in a metal alloy of superior hardness, from 8- to 72-point, and represent the most extensive collection of classic English Monotype book faces in the United States, including over 7,000 accented matrices. In an age of computer excellence, our metal typefaces continue to remain unsurpassed aesthetically for the design and production of outstanding letterpress printing, from simple ephemera to large, hand-bound, limited edition books. Work designed, set, printed, and bound in our shop is produced directly from our cast metal type on a variety of Vandercook and Heidelberg cylinder presses (maximum sheet size: 22 x 32 inches). Our Monotype composition and display typography is also available in repro proof or in metal for other letterpress printers. Fonts of type are cast on commission to any font scheme & any alignment including extra sorts, and sold by the pound, pending specific requirements. All machine composition sizes include small caps as well as roman and italic alphabets through 14-pt. Display sizes include roman and italic only (no small caps). All type is cast from English Monotype .050" drive matrices. A quote for machine composition, including rough proof and sorts, is provided on receipt of typescript. For further information or an estimate please write, call, or fax us.